Brownie Sampler for sale. Buy online at Zingerman's Mail Order. Gourmet Gifts. Food Gifts. You can't go wrong sending brownies to someone special. If you say you "sent them myself" they might even think you said "baked them myself." And you wouldn't correct them. Of course not. Almost a quarter pound each. Dense, fudgy, loaded with chocolate. One hundred percent natural with no preservatives or corn syrup or anything you can't pronounce. The Deluxe version of this gift box has six brownies: two each of our original Magic Brownies with toasted walnuts, no-nut Black Magic Brownies, and Pecan Blondies topped with sea salt. The Ultimate version adds four more: a no-nut Black Magic Brownie, an original Magic Brownie, plus two gluten-free Townie Brownies. Want to make a custom brownie box? 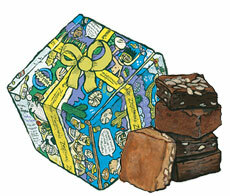 Check out our six-piece Custom Pastry Gift Box.